Unlike poor Colonel Brandon, who never made it across the border, we have leapt into our curricles and hotfooted it past Gretna and all the way to Edinburgh. We have the express intention of spending the season amongst the high society here, and what a bustle we find! For it is the Edinburgh Fringe, no less, and already our adventures in our Udderbelly home have begun. So far we have plucked from our top hats the delightful trio of ‘Sarcasm & Satire’, ‘Boldark’ and ‘The Red Ribbon’, and we wait in frenzied anticipation to see what wonders the remaining three weeks will hold. Do join us, dear reader, do! If you are of a saucier disposition, and yet possessed of a warm and charitable heart, you may also spare a thought for our one-off debauched spectacular Crosstentatious – in which (though we blush to utter it) the men dress as ladies, and the ladies as men! For shame! Ribald as these coarse entertainments are, it is all in aid of Waverley Care, and a finer cause one nary encounters. So if you are possessed of a hardy constitution, and have not your reputation to risk, you may invite yourself to the vulgar and boorish outrage on the 17th August right here. 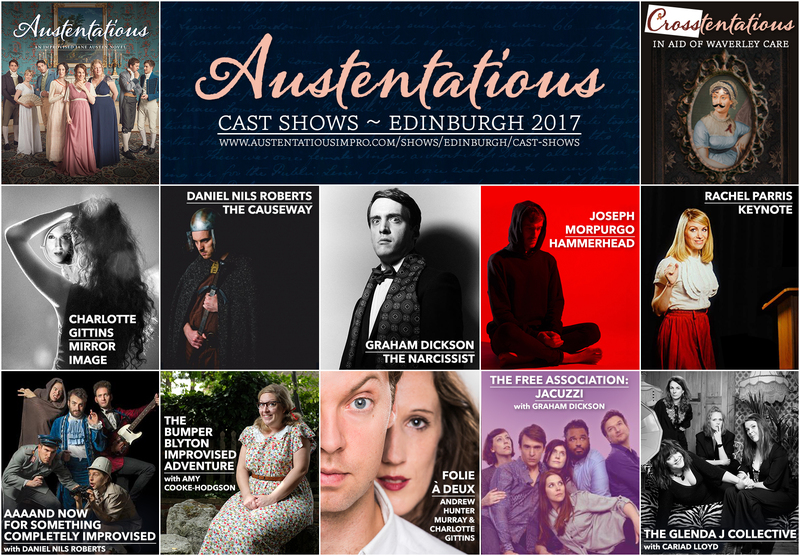 In addition to ‘Austentatious’ from 3rd~28th August, and our cross-dressed charity special ‘Crosstentatious’ on 17th, the cast would be thrilled to see you at their other Edinburgh Fringe shows! N.B. Those of a delicate Regency disposition should be warned: acts may feature modern dress and a hint of ankle.